For the locals! 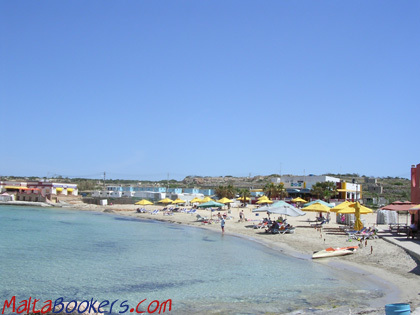 The pity about these two beaches is that they are surrounded with boat houses & Lidos. I would imagine that 100 years ago they would have been the most peaceful beaches in the Mediterranean. Even with all those people around, there is still a feeling of peace. They are worth visiting if you're bored with the other beaches and you want something different. Besides you can wonder off to the rocky parts if its too noisy and find a spot all for yourself. Some of the Lidos do look a little bit shabby here, but the locals love it. This beach is ideal if you want to sit down, eat, drink and relax while your children sit just next to you playing in the sand. Probably thats why its very popular with families. Getting there. From Mellieha, follow signs to the Gozo Ferry. At the top of the hill after Mellieha Bay you will see signs to Armier at the right.